(UPDATED 10/21/2018 BELOW) It’s not often we write about snail mail scams. Readers have sent us scams that targeted them via good old-fashioned U.S. Postal Service mail. We’re certain others may be targeted as well. First of all, we loved seeing this next old-fashioned, who-uses-fax-anymore scam! It came to us via a TDS reader with sharp eyes who noticed it was total fiction, not a legitimate bill. The fax arrived at a school on July 4, 2017. That’s our first hint that something isn’t right about this fax. 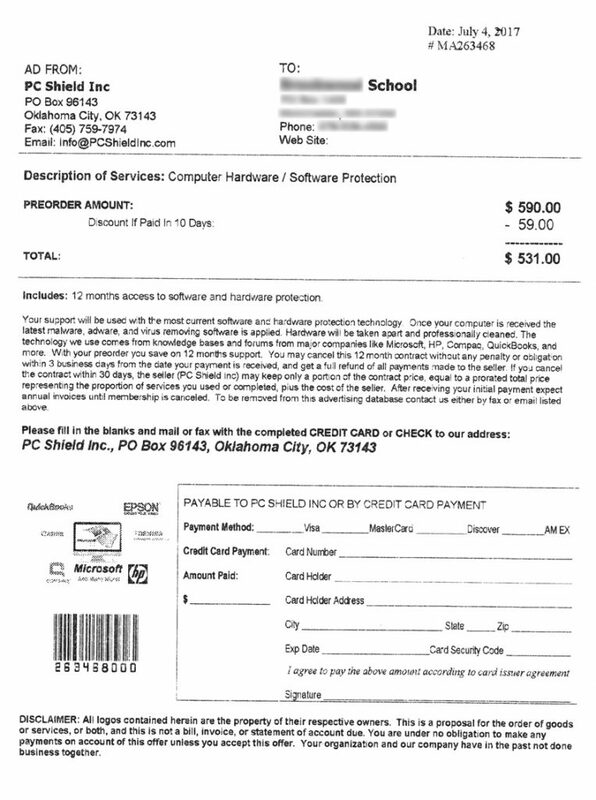 It’s a bill from PC Shield, Inc in Oklahoma City, OK. There is one small spot on the entire bill that says “Ad from.” Everything else about this bogus bill screams fraudulent billing practice. There’s no phone number and no website to visit. In fact, a visit to pcshield-DOT-com shows a BIG message saying “This Domain Name is Suspended.” However, you can email your payment to them or fax the payment information. The school, of course, doesn’t use this service and knows nothing about it. Next is a bill for $489.82 that was sent to an optometrist’s office for “2 years BOLD LISTING” from a service called AMERICAN SUPER PAGES. 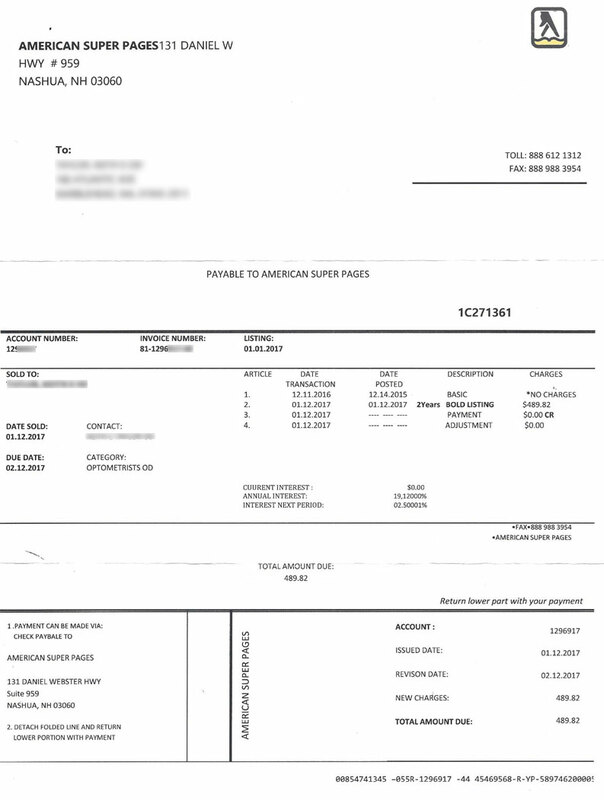 The envelope was posted in Miami, Florida though the address listed on the invoice for American Super Pages is 131 Daniel W Highway #959, Nashua, NH 03060. The optometrist’s office says they have never heard of this company, nor hired them for any purpose. The invoice has an account number, phone number, fax number and seems legitimate. 2. In 2014 and 2015 similar complaints were filed with RipOffReport.com from doctors against American Super Pages of San Diego, CA for similar practices. 3. In March and April, 2016 many people filed the same complaints against American Super Pages on the business review site called Revdex.com. There were many more complaints but you get the idea. We searched for American Super Pages at the address in Nashua, NH but found no business listing for them, no website, and no information at all. We did, however, find a newly listed “F” rating on the Better Business Bureau website from September, 2016 on American Super Pages in Nashua, NH. We also wondered why we saw many other businesses listed for this address until we discovered that the address is a UPS store with mailboxes. The address listed for American Super Pages is just a mail drop. And what about the toll-free number that was printed on the bill? 888-612-1312? A search for it turns up a BBB listing with a “B+” rating this business, but in Lubbock, Texas as well as a complaint on 800notes.com posted in January, 2017. The 800notes.com post complains that the company is a yellow pages scam. They got that right! Also, a couple of years ago we were contacted by a school with two fake bill stories. The first was very clever and the bill included personal school information adding to the level of authenticity. 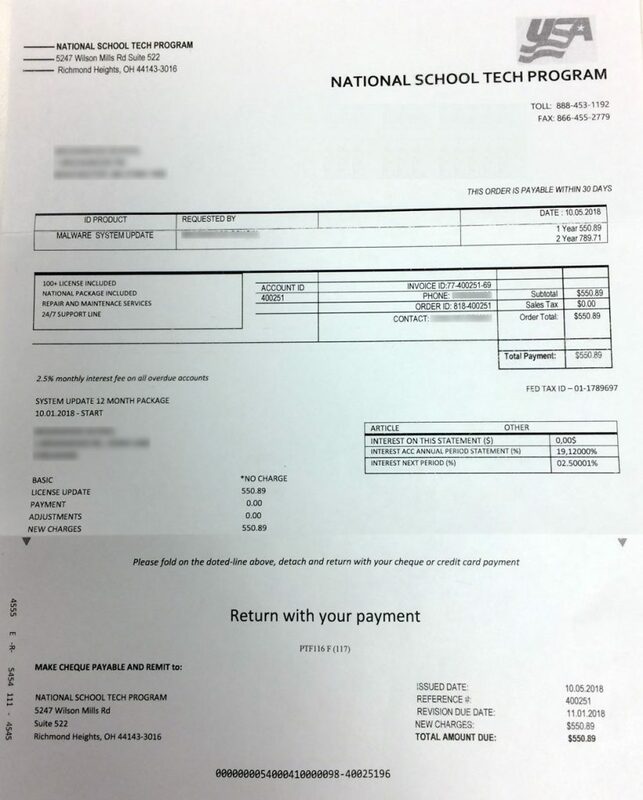 The Principal’s name, school phone and fax, as well as the math books the school might use were listed on the invoice. 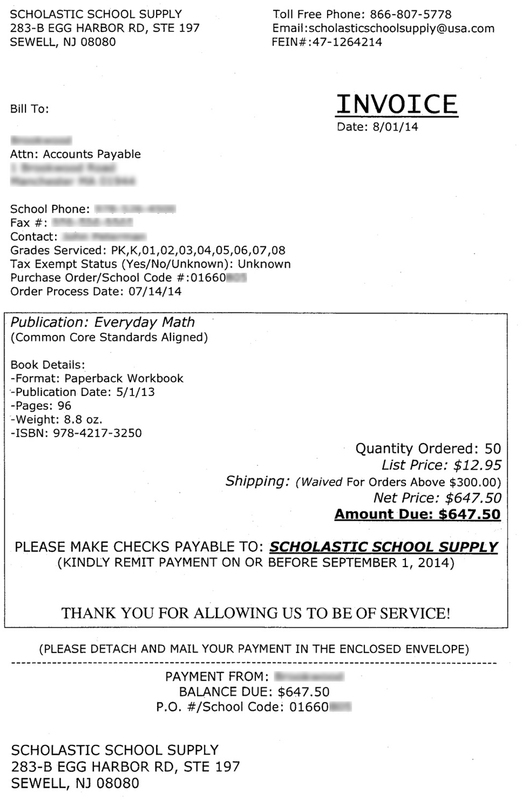 The invoice also included the full address of a seemingly legitimate business – Scholastic School Supply of Sewell, NJ. This last sample came from a company called UST, as in US Telecom. The bill has a web address listed as us-telecom.com, though Google cannot find any information on this website. A WHOIS look up shows that the domain was registered in 2002 to a Ben Dishler for the US Telecom Association and is hosted in Zurich, Switzerland. It isn’t even clear if this association is related to the mailbox drop in California shown on the bill. 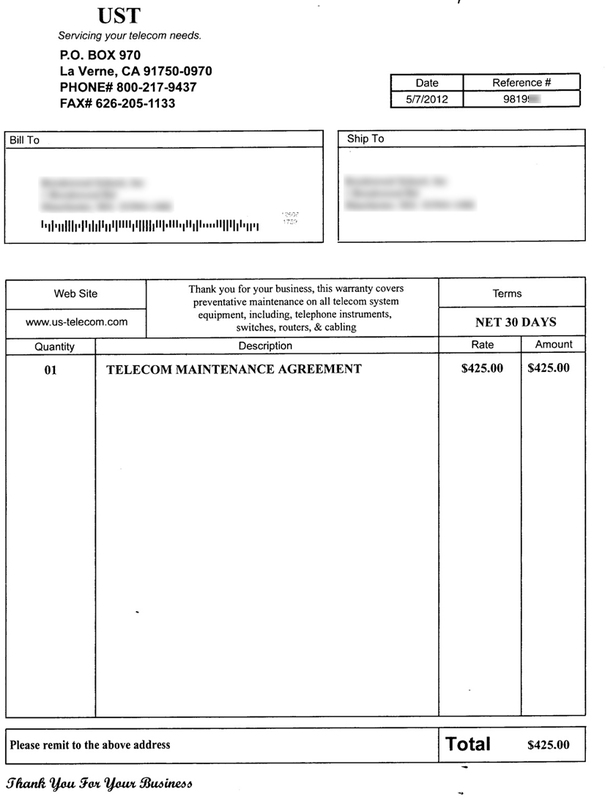 The school was being charged $425 for a “Telecom Maintenance Agreement.” The school says they have never heard of the company and have nothing to do with them. Again, this looks like it could be an innocent mistake in billing, right? The lesson for all businesses and non-profits is clear. Every billing department should have another employee sign off on all bills to authorize payment. Plain and simple. Looking at the bigger picture, we wonder if it might be the same scammers perpetrating all of these scams. The first we see was in 2012 and seems to have last many months to a year. Then came the second in late 2013 through most of 2014. Now we see another one this year. Let us know what you think? If you see billing scams like this, take a photo and email it along with any details to spoofs@thedailyscam.com. On February 23, 2018, the FTC.gov posted this article on fake invoices. We conducted a Google search for “National School Tech Program” and found bubkes — nothing at all! No business by that name, no website supporting said business. But we did find someone else who complained on ThisPhone.us about a bill he received from “National School Tech Program” for nearly the same amount. The address on his bill was 1320 State Route 9 # 31811, Champlain, NY 12919-5007. The person complaining said the name referenced on that bill hadn’t worked at their business for 9 years! Similarly, the above bill had a school employee’s name on it and that employee had not worked at the school in nearly four years! TDS actually spoke to someone in Ohio who passes that Wilson Mills Road address every day on his way to work. He told us that the place is a Postal Annex where people can rent mailboxes. Similarly, the New York address listed in Champlain is for Freeport Forwarding, a shipping center that sells mailboxes. We would sure like to know who shows up to open mailbox 522 in Ohio and 31811 in New York!